You were not mass produced. When God created you, he didn’t create you on an assembly like to look like every one else and process things like everyone else. He knows you. He cares for you. He designed you. I have been totally enamored by the artisan industry lately. Artisans train for years to become masters at what they are making. They actually care about the product that will make it to the marketplace. Artisans are found in a variety of fields – bread, cheese, wine, clocks, etc. If God is the master craftsman, what does that mean for us? What is our role? We are called to be artisans of faith. To truly care about growing in our knowledge of God. Spending extravagant time with him. Learning. Growing. As we continue to grow in our faith, we naturally begin to make disciples around us by sharing what we have learned. 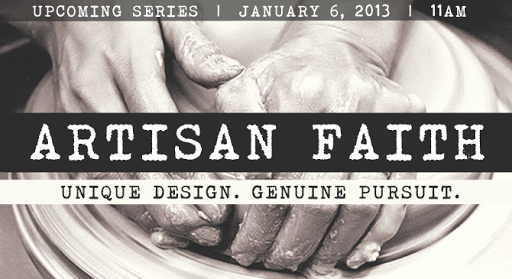 Artisan faith – unique design; genuine pursuit.